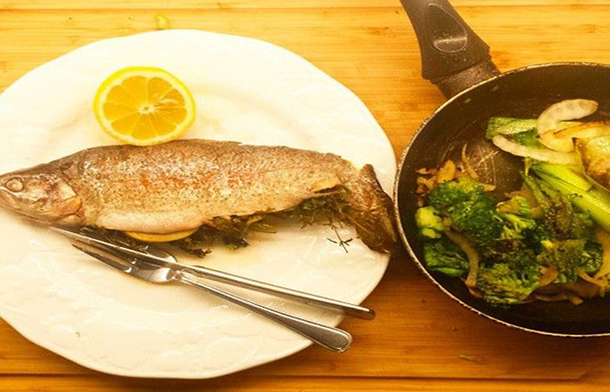 The refreshingly healthy baked trout is a perfect main course for 2. You could try it with other whole fish such as mackerel, snapper or sea bass. Clean and de-bone the fish (leaving the fish whole for stuffing). I found this went really well with a Gruner Veltliner, but you could have it with a light, fruity white wine. Set your oven to 200c. Sprinkle some salt inside the fish and rub the chillies in. Divide the mixed herbs into half and stuff into the fish and finish with sliding the lemon slices under the herbs. Rub the outside of the fish with olive oil and place it on a sheet of tin foil. Place the remaining lemon slices on top of the fish and individually wrap up the fish by bringing the longest sides of the foil together and crimping the edges, all the way down. Whilst the oven heats up, slice or chop up the vegetables into bite sized pieces. Put the fish into the oven and set the timer for 20 minutes. After 15 minutes, sauté the vegetables in a little olive oil and a sprinkle of salt. When the fish is cooked, carefully open the tin foil and slide each fish gently onto a plate, pouring all the juice over the top. Portion out the vegetables between the 2 plates, grab your napkin and dig right in with your fingers! This dish goes well with a light, fruity white wine.